I like going to parks alone. Give me a book, a blanket, and a comfortable tree trunk to lean against and I’m set for a few hours. But part of visiting parks in each ward in the city means I need some help. There are 1,600 parks after all, so if I didn’t get some help I might as well choose them by throwing a dart at the map we have on the wall in our office, which would actually be really fun, but also probably not welcomed by my coworkers. 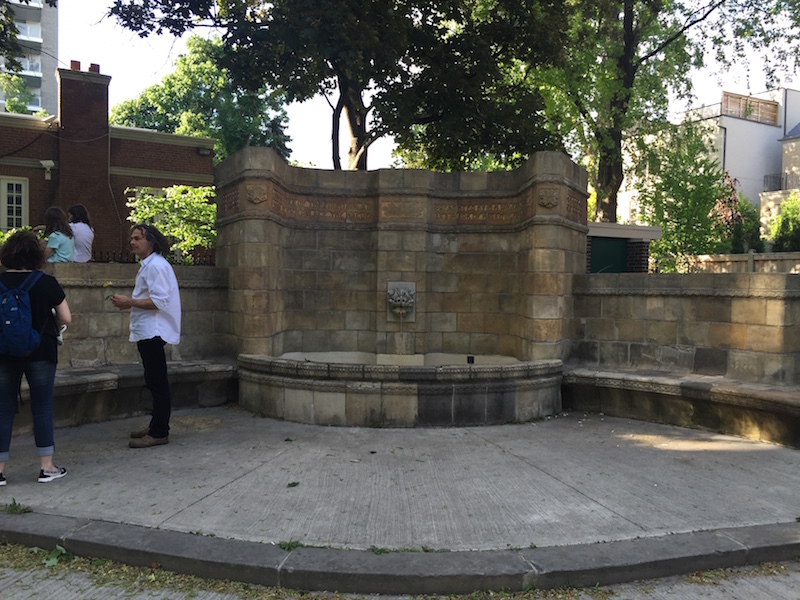 Luckily, two very nice people, Sharon and Terry, contacted me to show me around two parks sitting across from each other in their neighbourhood in Ward 22–Amsterdam Square and Glenn Gould Park. Amsterdam Square sits on the north-east side of St. Clair Avenue and Avenue Road and contains pleasant criss-crossing pathways and lots of shade. 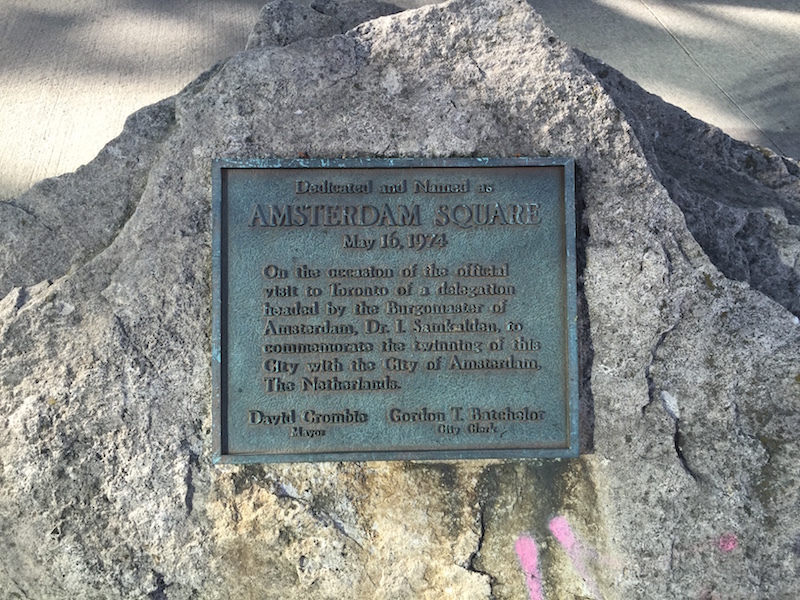 The park was named Amsterdam Square in 1974 when Toronto and Amsterdam became sister cities–too bad Toronto doesn’t take more cues from its sister regarding bike lanes. One thing Sharon pointed out to me was that there was one last old City of Toronto bench in Amsterdam Square, while the rest had been replaced with new benches. I really dislike the new standard benches. Not only do they have the middle armrest to prevent people from lying down, but they are made from plastic. They have none of the romance of the old benches, which have thin wooden slats with elegant metal arm rests on each end. It’s a shame we’re losing these, especially in a park like Amsterdam Square with its European style, only to replace them with benches that look like they come from Toys R Us. But forget my bench snootiness. 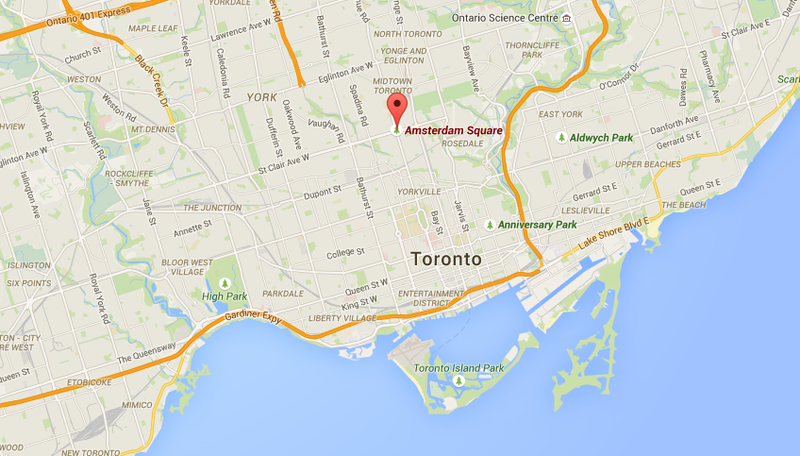 The really special thing about Amsterdam Square is the fountain in the north corner. It was donated to the City by a local realtor, H. H. Williams, who also donated the land for the park in the late 1920s. (A lot of the information in this post comes from this great Lost Rivers article.) Williams was inspired by a fountain at the Peace Palace in The Netherlands and so created a replica in the park. Like all good fountains, it has a lion that shoots water out of his mouth. 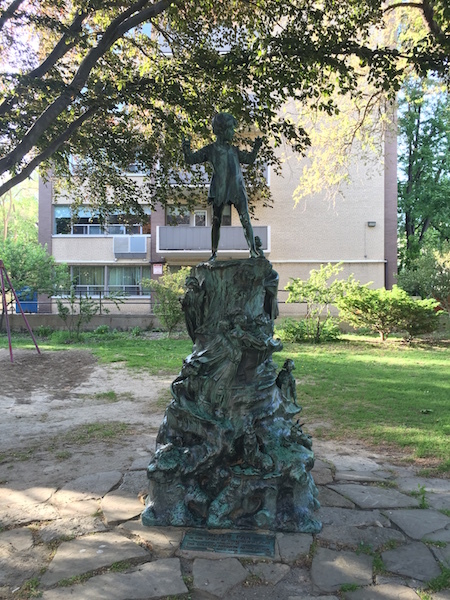 The same day that the fountain in Amsterdam Square was unveiled in 1929, the City also unveiled a Peter Pan statue in the park across the street. Because why unveil one thing when you can unveil two! Like the fountain, this statue was also a replica of one in Europe, this time in London’s Kensington Gardens. The statue looks like a boy playing a flute atop a big molten blob, but if you walk closer you find it is really intricate, with fairies, squirrels, and even small rats nests. On the top there is Peter Pan and a girl who appears to be trying to look up his skirt. The bronze is worn in many places and it became pretty clear why after two children ran up to the statue and began scrambling over it. Public art as play structure. This park is actually called Glenn Gould Park, but aside from the park sign stating so there’s no information about Glenn Gould or any other reference to him in the park. A block east on St. Clair reveals a historical plaque noting that Gould lived in the apartment there. Having something in the park would be nice, though. Otherwise one may get the wrong impression that Glenn Gould was actually a small child who liked to play the flute atop a hill of rats. Both parks are pleasant, but Amsterdam Square is noticeably quieter because it has more trees around its edges to create a buffer from the traffic noise from the nearby busy intersection. I also like the apartment building that opens up onto the park, which makes the park feel cosy and gives its edge more interest.Thanks to Terry and Sharon for the tour! I found Joel Weeks Park completely by accident, which is the best way to find a park. Tucked away just north of Queen Street East and right next to the Don River, I stumbled across it while on my way to a Spacing Magazine party near the end of April. The light was fading and so I didn’t get a good look at everything, but what I saw made me want to come back in the daylight. There’s lots I like about this park–the little canal that hugs one side of the children’s playground, the natural play features like stepping stone logs, the community garden, the shady picnic spots–but there is one thing that I want to focus on, and that’s how this park mixes soft and hard-surface areas really, really well. But before I do that, I need to talk about the squirrels. More specifically, the squirrels and their giant acorn god. How had I never heard of these squirrels before? These squirrels should be Instagram stars. These squirrels should have their own Pixar film. They have to be one of my new favourite pieces of public art in a park in Toronto. 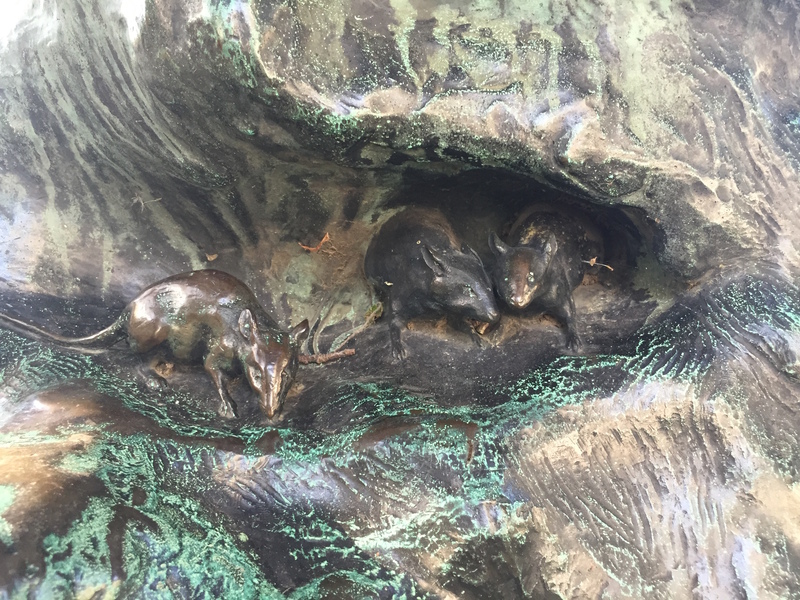 The genuflecting squirrels are part of a series of public art in the park installed in 2014 by aboriginal artists Mary Ann Barkhouse and Michael Belmore. There’s also a fox and a beaver, which, when I was there, two parents had plopped their baby on top of so it looked like it was riding the beaver like a horse. But back to that mix of green and grey. People sometimes turn their noses up at plazas in parks (“that’s not a park–that’s concrete,” is a typical comment), but really, both spaces are important. A good community park needs both grassy, lawn areas as well as hard-surfaced plaza spaces. In high-traffic areas, grass tends to go bald and all your left with is dirt and mud when it rains. So you need good pathways, but you also need community gathering spaces, and plazas can help create that focal point in a park and provide some solid ground for different kinds of activities. What Joel Weeks Park does so well is how it weaves both green space and plaza space together. The north end of the park is mostly lawn and a children’s playground, while the south end of the park has these wonderful pools of gardens and tree areas, which form a kind of archipelago within the hard-surface plaza. Concrete benches rise up on a curve off the ground, wrapping themselves around some of these garden areas to become long ledges for seating. At the centre of the park there is a small hill covered in grass that is cut so short its more like a five o’ clock shadow than a lawn. But the hill is a great place to sit or lie down for a moment and stare up at the clouds. It breaks up the park really nicely, separating the children’s playground area and larger green space from the plaza space to the south. Everything in the park has a pleasing curve to it–there’s no right angles to be found in the whole place. It makes the park feel like its in motion, a kind of meandering flow so that walking through the park feels like drifting along a river. While it’s not a particularly large park, I found myself wandering around and around in it, just following this natural flow. When I Googled the park when I got home, I learned that this is very deliberate. The design is meant to evoke the landscape and pattern of a river, like the nearby Don. So: mission accomplished. The park was actually a redesign and expansion of a former parkette, completed in the summer of 2012 and designed by Janet Rosenberg Studio–one of my favourite landscape architecture firms in Toronto. The redesign was part of the redevelopment of the Rivertown Toronto Community Housing development within which the park sits–the first conversion of a public housing development into a mixed-income community of its kind in Canada, according to the City. The name comes from a boy who drowned in a sewer nearby in 1982. Not the happiest of stories, obviously, but great that he has such a lovely park named after him. Yesterday after work, I biked over to High Park with a few friends to take in the annual blooming of the cherry blossom trees in the park. I had been warned that it was going to be a sea of people below to match the sea of blossoms above, and the warnings were right. But we managed to find a clear spot under a tree that had exploded into soft, pink petals and set out our picnic. There may have been more cell phone cameras and selfie-sticks in High Park than cherry blossoms, actually. It feels almost boring and old-man-yells-at-cloudish of me to even point this out, but there is something lost in these moments of great natural beauty when so much of our experience of them takes place not through our own five senses but within the tiny, microscopic pixels on our iPhones. Do we even look at all the photos that we take? But then again, as you can see, I did what everyone else was doing. I whipped out my phone and started snapping pictures of the blossoms and the general scene before me. And there were really two scenes going on. One was the blossoms themselves, which were stunning and delicate, but the other was the people and their cameras, which were weird and hilarious. And so I found myself taking pictures of people taking pictures of the blossoms. Like people taking pictures of blossoms with nice cameras. People taking their bloomin’ selfies. So many selfies. People working in teams to make damn sure they get every angle covered. So if you can, go to High Park to see the cherry blossoms. Or the people taking pictures of the cherry blossoms. Either way, it’s surreal. 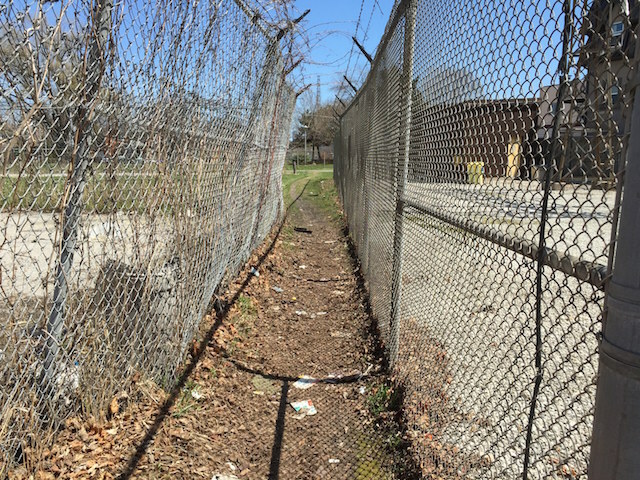 If you stand in one of the small parkettes under the hydro corridor north of Dupont Street in Toronto’s west end, you’ll find yourself on the site of a new vision for public space in the city: the Green Line. The Green Line exists currently as an idea—an idea to transform the hydro corridor that runs from Earlscourt Park to the Annex into a five-kilometre linear park. It’s an idea that, through the work of local residents, has taken hold of the imaginations of people across the city. 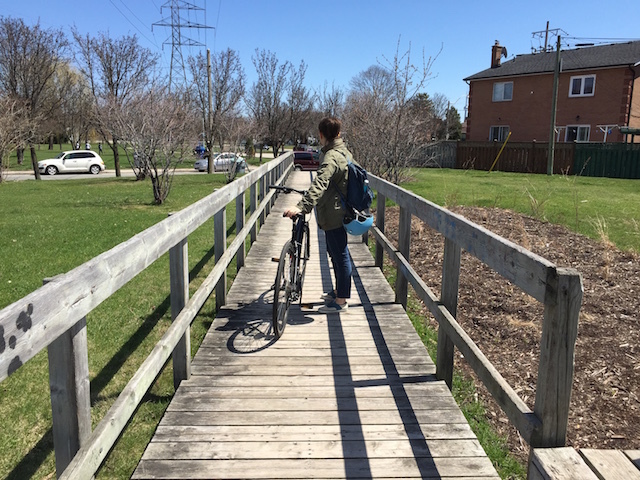 The Green Line, which would pass through three city wards and be close to two others, could provide more than new park space: it could also create walking and cycling connections, says Helena Grdadolnik. Grdadolnik lives and works near the proposed linear park. Associate director for Workshop Architecture, she is one of the Green Line’s original champions, first becoming interested in the idea when she attended a consultation for a local park in the hydro corridor. She left feeling frustrated. “Although I welcome these local investments—in this case it was $20,000 for some benches and replanting—I saw the need for a complete vision for the entire length of this corridor,” she says. The land along the Green Line varies in use and quality, much of it disconnected by roads, grade changes, and fencing. Owned by Infrastructure Ontario and operated by Hydro One, parcels are already leased for uses such as parking lots and nine small parks. Connecting these spaces into a cohesive whole will be a challenge, particularly where roads slice through the site, whisking cars under the railway that runs parallel to the Green Line. To spark interest in the project, Grdadolnik ran an ideas competition through Workshop Architecture. The 2012 Green Line ideas competition drew 80 submissions from Toronto and around the world, with ideas ranging from the practical (community garden spaces) to the fanciful (a mini-putt green). A challenge, but also an opportunity, of the Green Line is that it must function as a cohesive linear park that connects multiple neighbourhoods while at the same time providing local park space and amenities in communities that lack them. Joe Lobko, an architect and partner at DTAH who served as a judge in the Green Line ideas competition, acknowledges this tension, but likens it to the city’s main streets. In order to push the idea forward after the design competition, Toronto Park People, an independent charity that works with communities to improve Toronto’s parks, took up the project with funding from TD Bank. This year, Park People (where I work) helped form Friends of the Green Line, a group of local residents, such as Grdadolnik and the Castels, and others interested in making the Green Line a reality. All this attention has created momentum at Toronto City Hall. Council recently directed staff to negotiate licensing agreements when opportunities arise to transform the remaining Green Line land into parks. Council also approved using density bonus funds, which usually stay within the ward they were generated in, and park levies from future developments along Dupont Street for the Green Line, even though the project runs through adjacent city wards—a crucial source of funding and a vote of confidence in the Green Line vision. These movements are positive, but a master plan is still needed for the entire Green Line corridor, one that recognizes its potential as a linear park and brings different city divisions and community stakeholders together.